Oct. 18 or 19: $1000 worth of copper pipes stolen from a house under construction by White Oak Homes on Idlewilde Drive. Between Oct. 31 and Nov. 29: $7500 worth of copper wiring stolen from a location on Danielsville Road. Dec. 4: A man on Epps Bridge Parkway saw three individuals taking copper wire from a wooded area on his uncle's adjacent property. He blocked their vehicle with his, and they were charged with attempted theft by taking and criminal trespass. Between Dec. 12 and 13: $900 worth of copper wiring was taken out of three apartments at the Oakwood Forest complex on Fourth Street (along with seven air conditioning units from another location on the property). A suspect's vehicle was identified. Dec. 13 or 14: $2300 worth of copper wiring was stolen from a house under construction on Bridgewater Circle. Between Dec. 16 and 17: Eight houses under construction by Starr Home Builders on Katydid Drive and Bridgewater Way were burgled of $2800 worth of copper wire. Between Dec. 12 and 26: An Altarstone Drive property had copper pipe stolen along with a refrigerator, carpeting, and two air conditioning units, a total value of $3130. This is the first time I voted for a mayoral candidate who won. 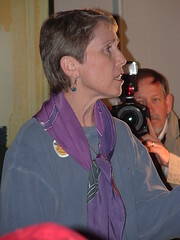 Heidi Davison thanked her supporters and pledged to do her best again for the next four years. Kelly Girtz had to miss his opening day of commissioner training because that was today and he wasn't elected until today. The state is used to having partisan county commission elections that get decided by the general election. He thanked his supporters for electing him commissioner in District 9 and encouraged everyone to stay involved with their community. 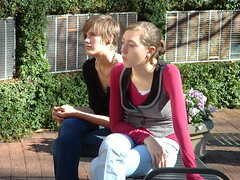 Just after noon at the Tate Center Plaza the Campus Greens began a funeral march for the writ of habeas corpus. 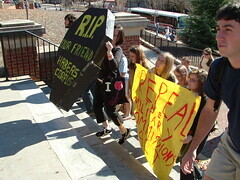 It proceeded to the Arch with students carrying a fake coffin labeled "R.I.P. 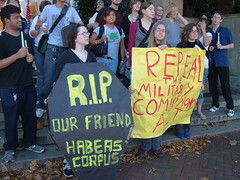 OUR FRIEND HABEAS CORPUS" and a banner that said "REPEAL THE MILITARY COMMISSIONS ACT." They sang and chanted phrases like "Where have our rights gone?" 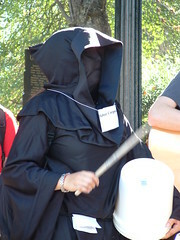 Computer science professor Dan Everett participated in the march wearing a black robe. 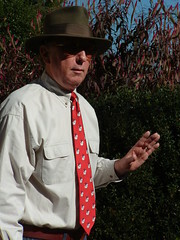 Law professor Donald Wilkes joined, too, but wearing his trademark red Bulldogs tie and fedora. The campus was busy as this must have been a time for class changes. On the way up Sanford Drive, a man in a ROTC uniform said about someone, "That guy doesn't deserve freedom." I wondered aloud, "Does he even know what habeas corpus is?" A woman in the march agreed with my sentiment and said that many people will probably have to look up the term. For those that forgot their Latin legal terms, the device of the writ of habeas corpus gives prisoners the right to be brought before a judge and have the government justify his or her imprisonment. The U.S. Constitution says that "The Privilege of the Writ of Habeas Corpus shall not be suspended, unless when in Cases of Rebellion or Invasion the public Safety may require it." U.S. Const. art. I, Â§ 9, cl. 2. The Military Commissions Act is a brand new law that is supposed to "authorize trial by military commission for violations of the law of war." Military Commissions Act of 2006, Pub. L. No. 109-366, 120 Stat. 2600. This act was brought about because the Bush administration opposes the necessity of bringing a military combatant held in a place like Guantanamo Bay before a judge. The Supreme Court ruled earlier this year that military commissions could potentially satisfy this right to be brought before a judge, but at that point the procedures in place were inadequate under the Constitution. See Hamdan v. Rumsfeld, 126 S. Ct. 2749, 165 L. Ed. 2d 723, 74 U.S.L.W. 4579 (2006). So what is the controversy? Some believe that habeas corpus can only be satisfied through an Article III court, and others believe that the Military Commissions Act goes too far and allows the violation of international law. Most importantly, it has been explained to me that the Act actually makes habeas corpus unavailable to non-citizen combatants -- even while that status has not been finalized. The group stayed at the Arch for a couple of minutes and then marched south to the President's Club Garden at Old College. Professor Wilkes delivered a "funeral oration" for habeas corpus, or rather a lecture about the history and importance of habeas corpus. He said that the right is a "palladium" and a "bulwark" of civil liberties. He said that he has researched this doctrine extensively, going as far as to study the original parchment bearing the English Habeas Corpus Act of 1679. He went on to say that no other president has done as much to erode civil liberties as George W. Bush, and -- Wilkes is a controversial figure, mind you -- he said that Bush's gravestone will bear the epitaph "Here lies a war criminal." 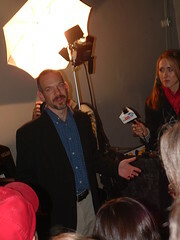 But he expressed optimism that the 110th Congress will curtail some of the changes that Bush has championed. Elizabeth Bishop sang a song about preserving civil liberties to the tune of "My Country 'Tis of Thee." 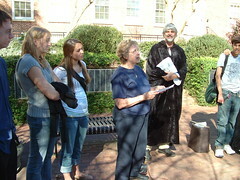 Professor Wilkes explains habeas corpus in the Flagpole.